On March 15 through 17, 1919, The American Legion was founded in Paris at the first caucus by members of the American Expeditionary Force. On May 19, 1919 the caucus meeting in St. Louis adopted "The American Legion" as the organization's official name. The Legion's draft constitution was approved, and so was its preamble, which begins: "For God and Country, we associate ourselves together. . ." The preamble, with its heartfelt dedication to freedom and democracy, is still recited today at official gatherings of The American Legion. On June 9, 1919, the National Executive Committee of The American Legion adopted the Legion Emblem, and on Sept. 16, 1919, the U.S. Congress chartered The American Legion. This patriotic, mutual help and community service organization has a worldwide membership of nearly three million -- men and women -- in nearly 15,000 American Legion Posts worldwide. These Posts are organized into 55 Departments -- one each for the 50 states, the District of Columbia, Puerto Rico, France, Mexico, and the Philippines. The Department of Virginia is comprised of 213 posts divided into 17 Districts (Post 110 is in the 2nd District), and Virginia currently has over 54,000 members. The Department Headquarters office is located in Richmond, VA.
American Legion Post 110 of Virginia Beach, Virginia had its beginnings in the spring of 1985 when a recruitment booth was set up at Pembroke Mall and was manned by Trudy Leinback of Post 118 and Ted Sakis of Post 113. 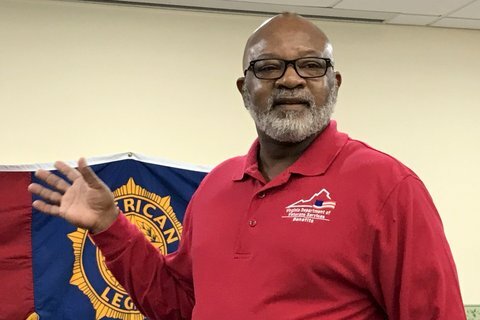 Over the next three years the numbers of military veterans grew, James L. Lashure was elected as Post Commander, and he applied to the American Legion National Headquarters for a charter. 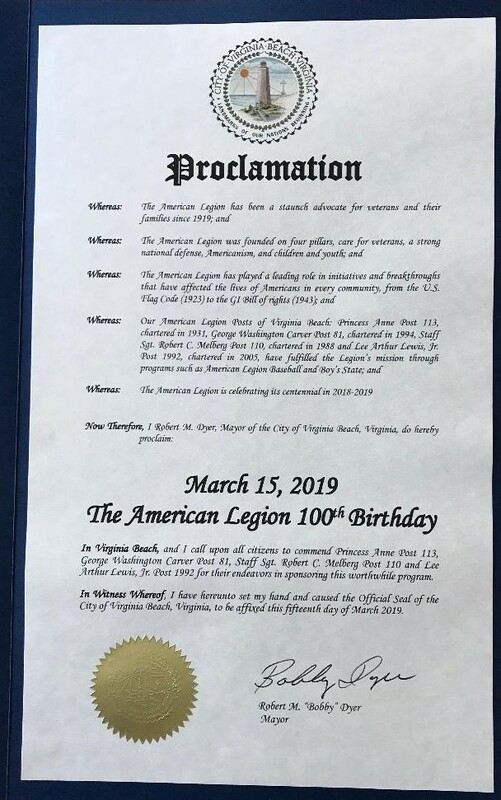 The Charter for American Legion Post 110 was signed by the American Legion National Commander in Indianapolis, Indiana on April 19, 1988 and countersigned by the Virginia Department Commander on April 29, 1988. Thus, American Legion Post 110 was established. 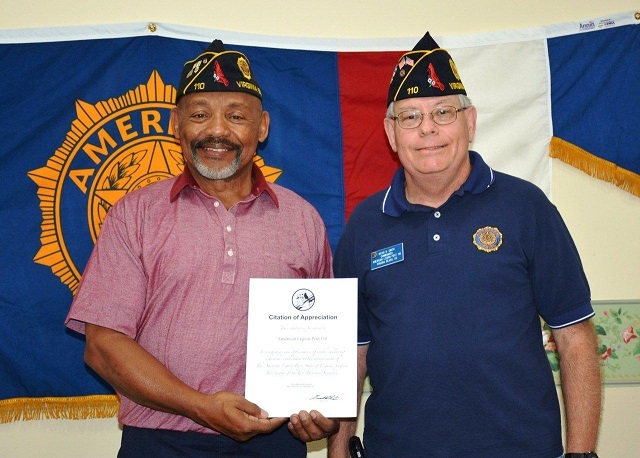 Since accepting this Charter in April 1988, American Legion Post 110 has continued to serve the area’s military veterans at the highest level possible. 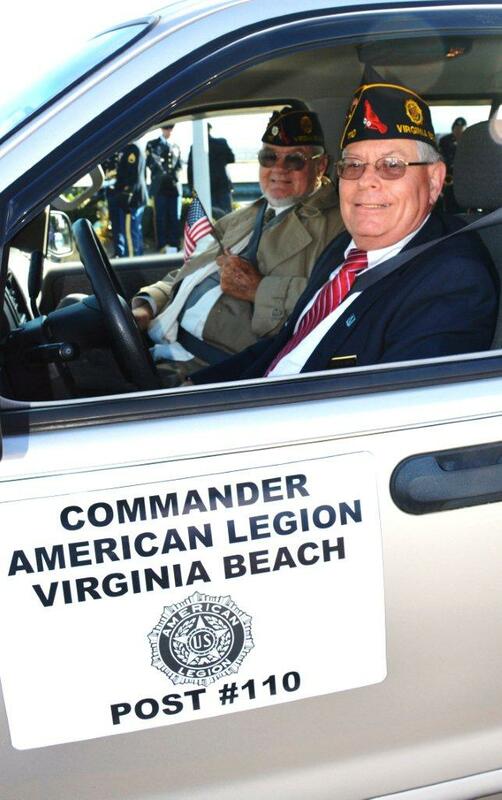 Post Commanders have, over the years, held monthly meetings at various locations in the Virginia Beach area. Locating a permanent “Post Home” is a top level priority of Post 110’s Officers and the general membership. 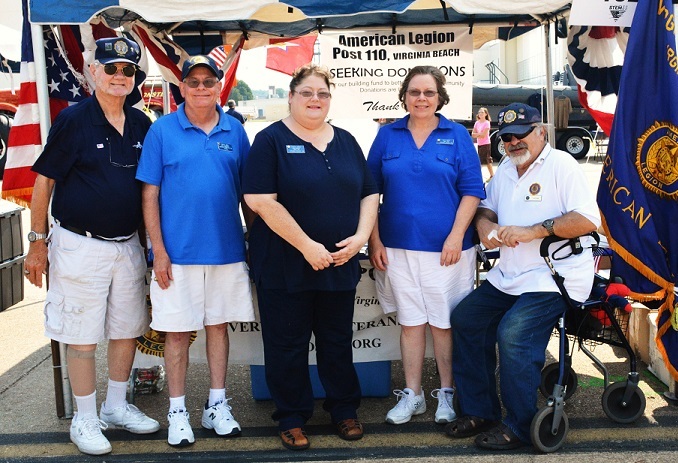 American Legion Post 110 participates in events, conferences, and meetings conducted by the American Legion National headquarters and the Second District of the Virginia Department. Post 110 plans and conducts ceremonies in honor of Memorial Day, Independence Day, Flag Day, Patriots Day, POW/MIA Ceremony, and Veterans Day. Post 110 also participates in other community programs that support our military veterans. 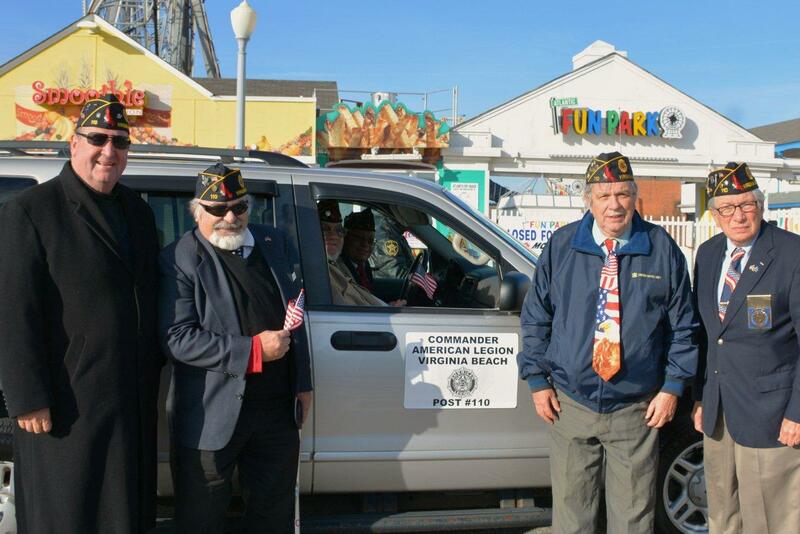 American Legion Post 110’s motto is “Every Day is Veterans Day”. 2012-2015 Bertrum W. Wendell, Jr. Article in the Virginia Beach Beacon, Thursday, March 28, 2019. Landstown High School held its 2017-2018 NJROTC Awards Night on May 2, 2018 in VA Beach, VA. American Legion Post 110 presented awards to two very deserving Cadets. Cadet Francesca Vuocolo received the NJROTC Scholastic Excellence Award and Cadet Daniel Ward the NJROTC Military Excellence Award. 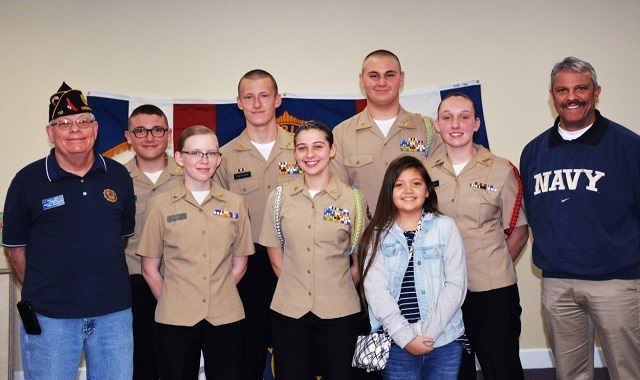 In the photo (l to r) are CDR William S. Wales, USN (Retired), Senior Naval Science Instructor, Cadet Vuocolo, Post 110 Commander David Smith, Post Chaplain George Schmidt, Cadet Ward and AOCS Valerie McQueen-Vance, USN (Retired), Naval Science Instructor. The SSGT Robert C. Melberg, USA, American Legion Post 110 and its Auxiliary Unit of Virginia Beach, VA held its 2017 Christmas Party at Gus and George's Restaurant on December 13, 2017. 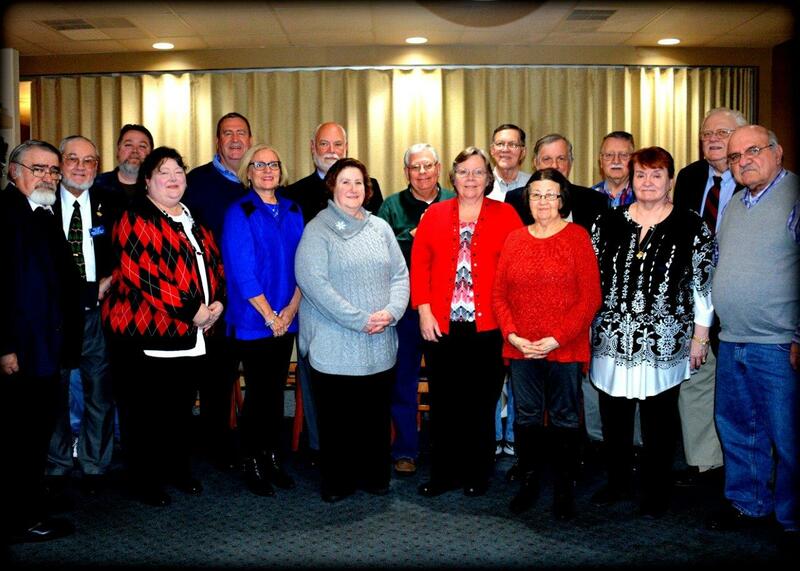 In the photo left to right are (front row) Mary Kinkin, Jeff Kocab, Ivy, Sandy Wendell, Tonya Jones (Auxiliary President), Jane McKeel, Bob Russell, (back row) Fred Kinkin, George Schmidt, Mark McMillan, David Smith (Post Commander), Dale Smith, Rick Jones, Vicky Huber, and Craig Huber. 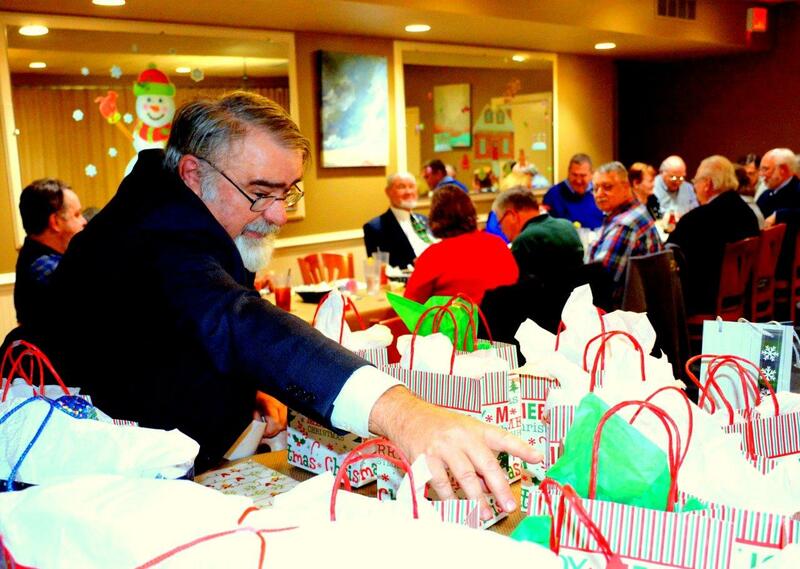 Photography by Bert Wendell, Jr.
Dale Smith, a member of the SSGT Robert C. Melberg, USA, American Legion Post 110's Auxiliary Unit, selects a door prize during the Post's 2017 Christmas Party which was held at Gus and George's Restaurant in Virginia Beach, VA on December 13, 2017. 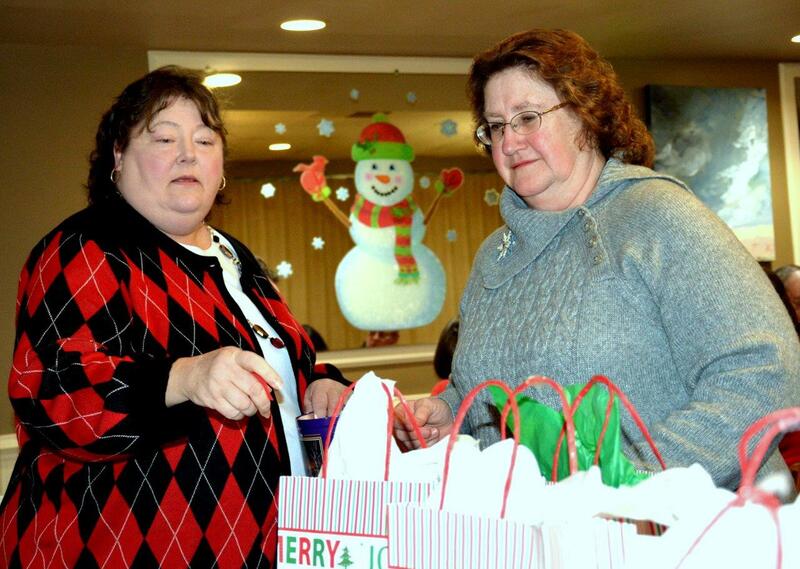 Photography by Bert Wendell, Jr.
Legionnaire Mark McMillan (r) is assisted by Tonya Jones (c), president of Post 110's Auxiliary Unit, in selecting a door prize at the 2017 Christmas Party of the SSGT Robert C. Melberg, USA, American Legion Post 110 at Gus and George's Restaurant in Virginia Beach, VA on December 13, 2017. 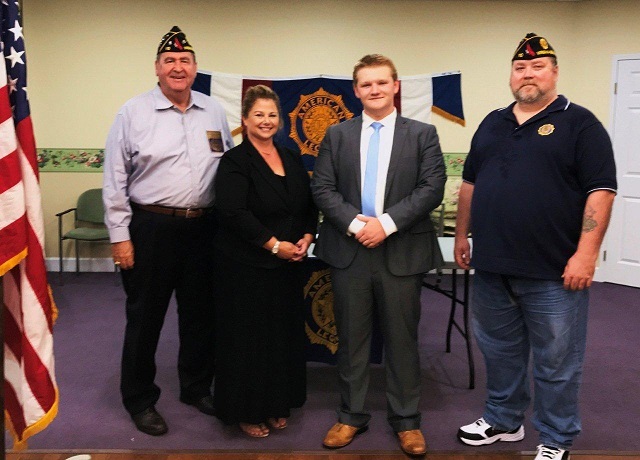 Photography by Bert Wendell, Jr.
Virginia General Assembly Delegate Jason S. Miyares, Virginia Beach's 82th District, spoke to members of American Legion Post 110 during its meeting on August 9, 2017. Miyares, the first Cuba-American elected to the Virginia General Assembly, talked about issues important to his constituents and his mother's, Miriam Maria Miyares, legal immigration to the United States in 1965 after fleeing communist Cuba. 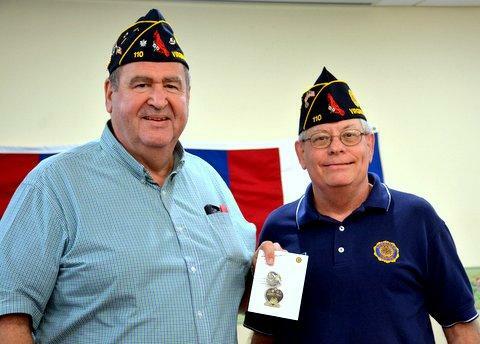 Photography by Bert Wendell, Jr.
Legionnaire Craig Huber (left) receives a 25 year American Legion Membership Pin from Post Commander David Smith (right) during Post 110's monthly meeting on August 9, 2017. Photography by Bert Wendell, Jr.
George Schmidt (left), Chaplain of American Legion Post 110 of Virginia Beach, VA, presented a "Post Everlasting Certificate" to Mrs. Christine Stauffer (center) to honor the American Legion service of her husband, Melvin S. Stauffer, who passed away on July 26, 2017. 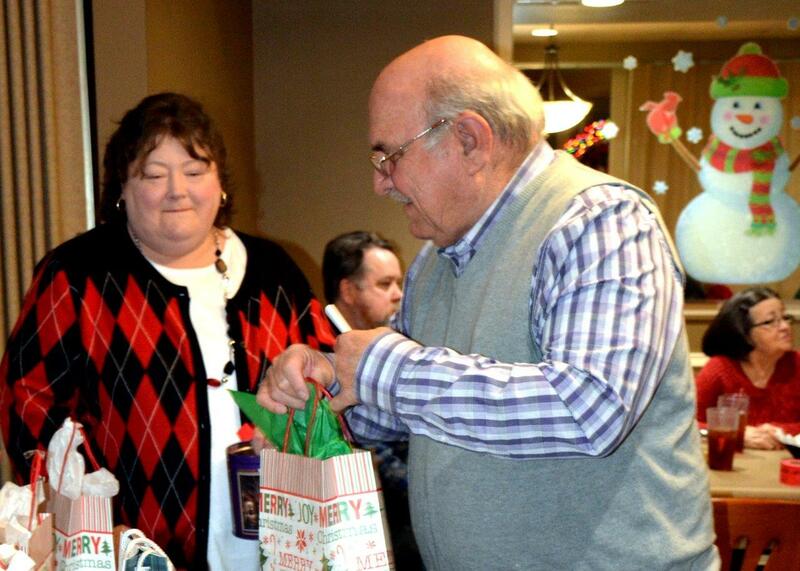 The Stauffer's daughter, Cindy (right), and Post Commander David Smith (far right) looks on with pride. Photography by Bert Wendell, Jr.
American Legion Post Commander David Smith speaks to residents of Our Lady of Perpetual Help Senior Care Center and other legionnaires in VA Beach, VA during 'Flag Day" ceremonies on June 13, 2017. 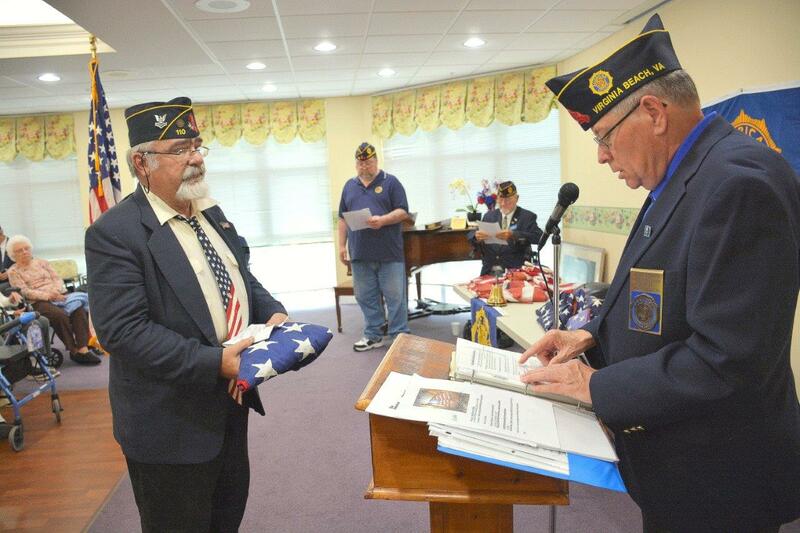 American Legion "Flag Day" ceremonies were held at Our Lady of Perpetual Help Senior Care Center, VA Beach, VA, on June 13, 2017. Attending the ceremony were World War II and Korean War veterans that reside at OLPH. Each received a veterans baseball cap from Raul Pernites, Activities Director at OLPH, In photo (l to r) front row are Lewis Reavis (U.S. Coast Guard), Maurice Brimer (U.S. Army), Albert Greer (U.S. Navy), George Mallek (U.S. Army Korean War Veteran), Edwin Mazzanti (U.S. Navy), and Robert Winters (U.S. Navy). In the back row are American Legion Post 110 Commander David Smith, Post 113 Commander Wayne Mead, Clifford Dietz (Post 113), John Hilton (Post 113), Jake Land (Post 113), Post 110 Adjutant Fred Kinkin, and Post 118 Commander Susan Merling. 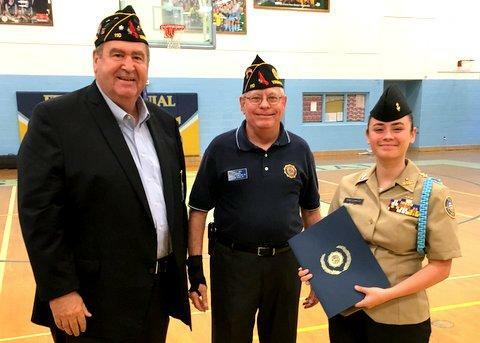 The SSGT Robert C. Melberg, USA, American Legion Post 110 of Virginia Beach, VA presented medals and certificates to two very deserving cadets of the First Colonial H.S. NJROTC Corps on May 18, 2017. The American Legion Scholastic Excellence Medal was awarded to Cadet SCPO Ethan Kelch and the Military Excellence Medal went to LTjg Natalie Hood. In the photo (l to r) are Post Commander David Smith; Capt. Timothy Richardt, USN (Ret. ), Senior Naval Science Instructor; Cadet SCPO Kelch; MCPO Charles Aardahl, Naval Science Instructor; Cadet LTjg Hood; and Post Adjutant Fred Kinkin. DSC 5970: American Legion Post 110 Adjutant Fred Kinkin presents the American Legion NJROTC Scholastic Excellence Medal to Cadet SCPO Ethan Kelch at First Colonial High School's NJROTC Awards Ceremony on May 18, 2017 in Virginia Beach, VA.
DSC 5973: Cadet LTjg Natalie Hood was awarded the American Legion Military Excellence Medal by Post 110 Adjutant Fred Kinkin at First Colonial High School's NJROTC Awards Ceremony on May 18, 2017 in Virginia Beach, VA.
American Legion Post 110 Commander David Smith and Adjutant Fred Kinkin presented Vietnam Era Veteran Lapel Pins and certificates to three Vietnam Era Veterans on May 10, 2017 in Virginia Beach, VA. To qualify for these 50th Anniversity of the Vietnam War Commemoration items the veteran must have served on active duty during the period November 1, 1955 and May 15, 1975. 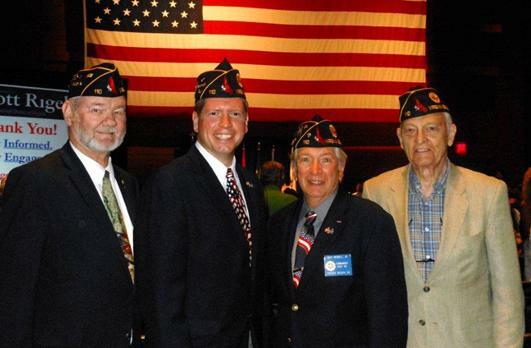 In the photo (l to r) are: Adjutant Fred Kinkin, Richard Kaye, Lyle Phetteplace, Kennerly Brown, and Commander Smith." Photography by Bert Wendell, Jr.
To commemorate the 50th Anniversary of the Vietnam War, American Legion Post 110 Commander David Smith and Post Adjutant Fred Kinkin presented Vietnam Era lapel pins along with Presidential Proclamation certificates to five veterans during Post 110's meeting on April 12, 2017 in Virginia Beach, VA. In the photo (l to r) are: Adjutant Fred Kinkin, Russell Frazier, Joe DeLong, Fred Kalmbach, Wendell Parker, Bill Helfen, and Commander David Smith. 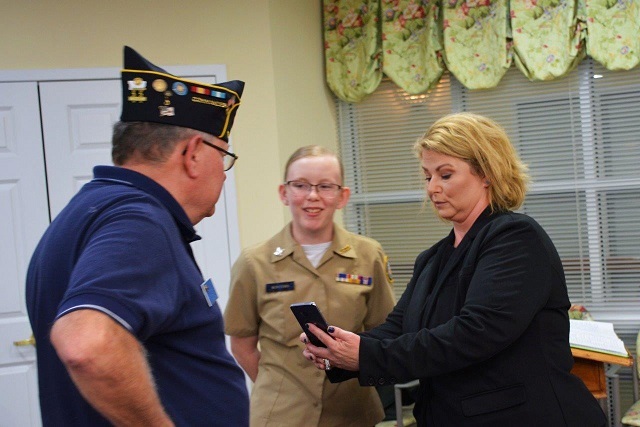 Photography by Bert Wendell, Jr.
American Legion Post 110 Commander David Smith presents a framed copy of the American Legion Charter that renames the Post as "SSGT Robert C. Melberg, USA, American Legion Post 110, Virginia Beach, VA" to the Melberg Family on April 12, 2017. The Melberg Family also presented Post 110 with a gracious contribution towards its efforts to obtain a permanent Post home. In the photo (l to r) is Post Commander David Smith, Mea Melberg-Rosner, Rachel Rosner, and Carl R. Melberg. Photography by Bert Wendell, Jr.
After leaving Germany in January 1946, SSGT Robert C. Melberg, USA, was discharged and returned to his family home in Ponca City, OK. Read Robert's Biography Here! Photograph courtesy of the Melberg Family. 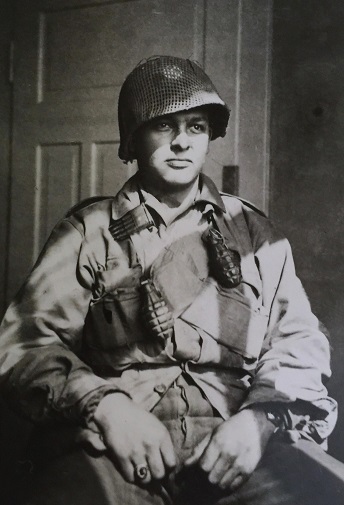 SSGT Robert C. Melberg, USA, in full combat uniform, took this self portrait just prior to entering combat operations leading up to WWII's "Battle of the Bulge" in 1944-45. He was a squad leader with Company B, 335th Infantry, 84th Infantry Division (Railsplitters). Photograph courtesy of the Melberg Family. 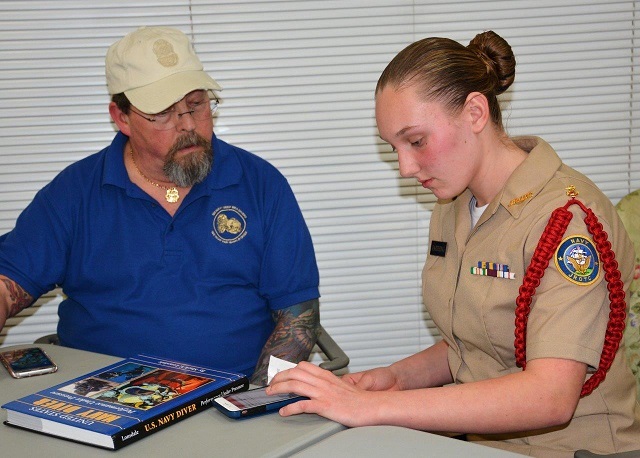 American Legion Post 110's 2nd Vice Commander, Robert C. Melberg, was photographed at a membership recruitment event in September 2014. 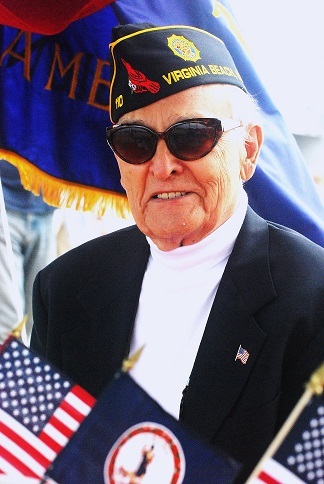 Bob was always a dedicated legionnaire wearing his signature blue blazer, white turtle neck sweater, sunglasses, and American Legion hat. Photography by Bert Wendell, Jr.
Five Legionnaires of American Legion Post 110 of Virginia Beach, VA were presented with a Lapel Pin and Presidential Proclamation Letter that commemorates the 50th Anniversity of the Vietnam War. 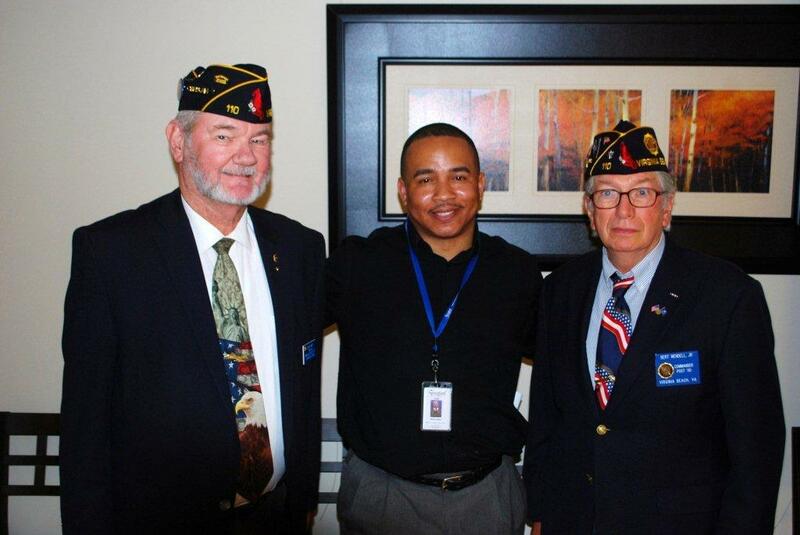 Making the presentation was Percy Glenn Dozier (center), a Readjustment Counseling Technician with the Department of Veteran Affairs, on February 8, 2017 at Post 110's monthly meeting. The Vietnam War Veterans are (left to right) Bert Wendell, Jr., Past Post Commander; George Schmidt, Post Chaplain; Jeff Kocab; Steve Sokolowski, Post Finance Officer; and Fred Kinkin, Post Adjutant. On the right witnessing the presentation was Rick Jones, Post Vice Commander. 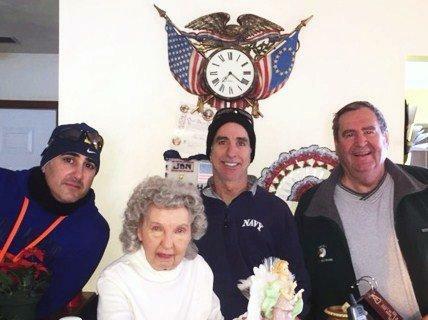 During the recent January 2017 snow blizzard in Virginia Beach, VA, Evelyn Hill (center), widow of a deceased U.S. Army veteran, contacted American Legion Post 110 to remove the vast quanity of snow that had collected on her sidewalk and driveway. Heeding the call were Post 110 members (left to right) Post Sergeant-at-Arms Steven Wild, Legionairre Roger Dadiomoff, and Post Adjutant Fred Kinkin. Photo courtesy of Fred Kinkin. 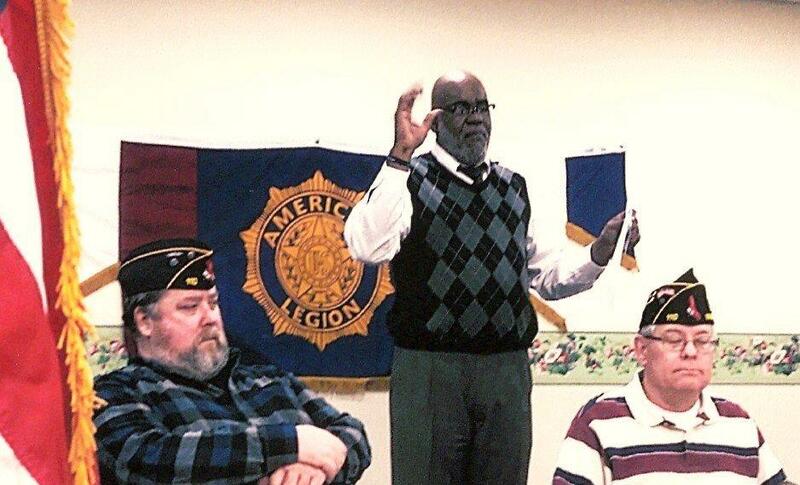 Mr. P. Glenn Dozier (center), Readjustment Counseling Technician for the Department of Veterans Affairs, spoke to members of American Legion Post 110 and its Auxiliary Unit on January 11, 2016. He advised members on the many services available to them at the VET Center, 324 Southport Circle, Suite 102, Virginia Beach, VA 23452. Also in the photo are Post 110 Vice Commader Rick Jones (left) and Post Commander David Smith (right). Photo By: Bert Wendell, Jr. Congressman Scott Rigell (left), Virginia 2nd District, discusses VA issues with members of American Legion Post 110 and its Auxiliary Unit during their monthly meeting on November 9, 2016 at OLPH Senior Care Center, VA Beach, VA. Congressman Scott Rigell presented a "Scott Rigell Challenge Coin" to Steven Wild (center) for being the youngest veteran at the meeting, and to Miriam Triscritti (right) for being the oldest veteran present and a fellow Marine at the meeting. 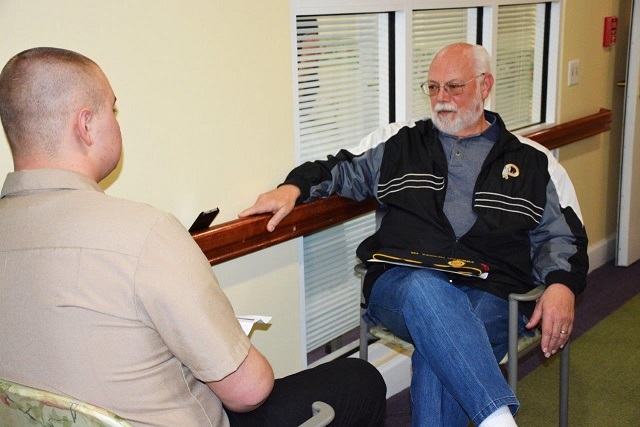 David Smith (left), Commander, American Legion Post 110, delivers a "Veterans Day Speech" to staff, residents and veterans at OLPH Senior Care Center, VA Beach, VA on November 10, 2016. Legionnaires of American Legion Post 110 and Post 113 presided over program for the staff, residents and veterans of OLPH Senior Care Center. 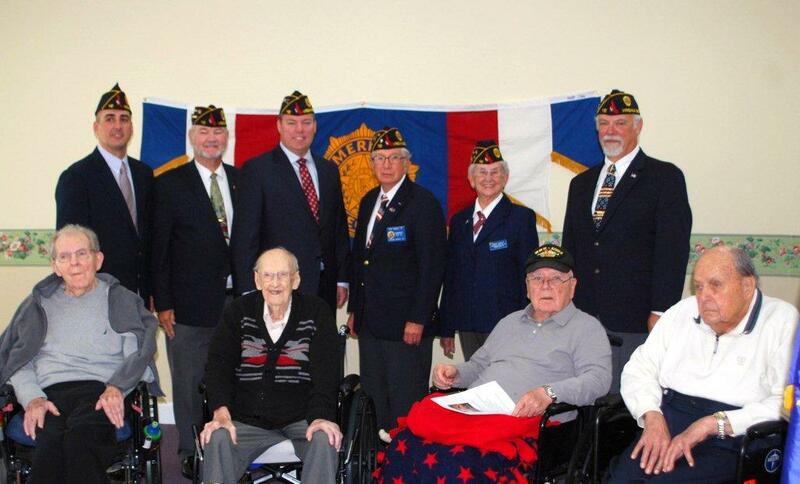 In the photo (left to right) is Homer Stinson, Chaplain George Schmidt, Jeff Kocab, Post 113 Commander Wayne Mead, Post 110 Commander David Smith, Post 110 Past Commander Bert Wendell, Jr., and Miriam Triscritti. 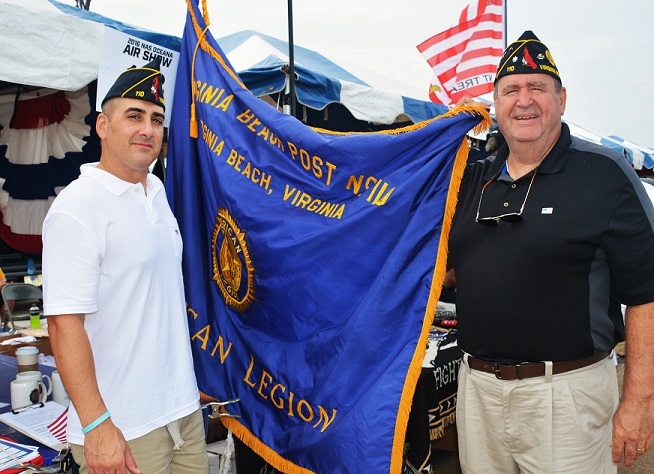 American Legion Post 110 of VA Beach, VA conducted a membership drive and accepted donations for the "Post Building Fund" at the NAS Oceana Air Show held on September 10-11, 2016. Those Post 110 legionnaires and auxiliary members working at the Post 110 Booth were Steven Wild, Fred Kinkin, David Smith, George Schmidt, Jeff Kocab, Bert Wendell, Jr., Tim Richardt, Tonya Jones, Dale Smith, and Ashton Tindall. Photography by Bert Wendell, Jr.
American Legion Post 110 of VA Beach, VA held a "Patriots Day Ceremony" on September 9, 2016 at Our Lady of Perpetual Help Senior Care Center. The ceremony remembered those fallen during the 9/11/2001 attack on New York City, Washington, DC, and Shanksville, PA. Also remembered were those US Military personnel that lost there lives during all wars. 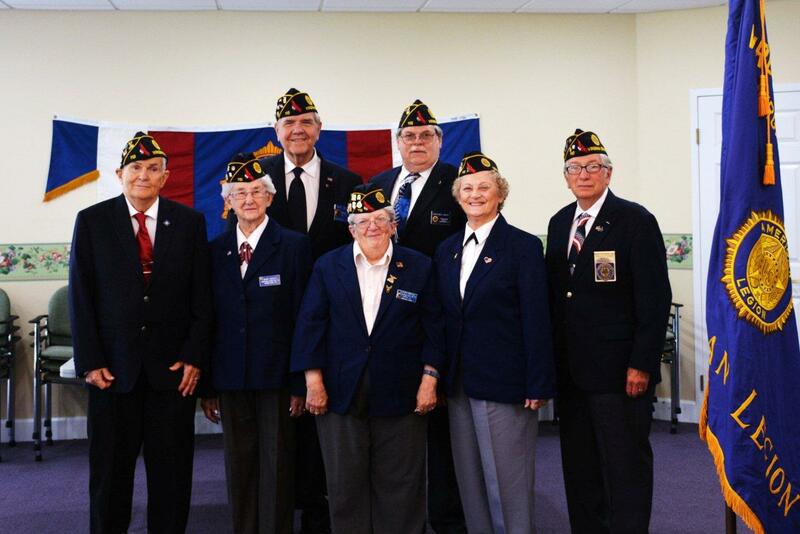 In the photo (left to right) are: Past Post Commander Bert Wendell, Jr., Chaplain George Schmidt, Mary Kinkin (Post 110 Auxillary Unit), Adjutant Fred Kinkin, Vice Commander David Smith, Jeff Kocab, Homer Stinson, and Ed Slavik. 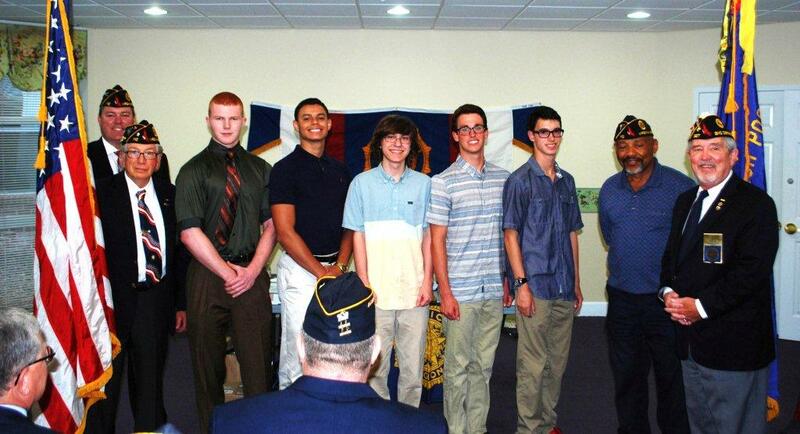 2016 Virginia Boys State Delegates, which were sponsored by American Legion Post 110, spoke to members of Post 110 and its Auxcillary Unit 110 on August 10, 2016 about their experiences at the conference which was held in June at Radford University. In the photo (left to right) is Post Vice Commander Dave Smith; Thomas G. Carter and Nathan L Ocampo both of Bishop Sullivan High School; Jarrod M. Tanedo and Christopher A. Cruz both of Kellam High School; and Dr. Wendell E. Parker, Post 110's Boys State Coordinator. At the August 10, 2016 meeting of American Legion Post 110 and its Auxcillary Unit 110, 2016 Virginia Boys State Delegate Thomas G. Carter (back to camera) spoke about his experiences during the week long conference held at Radford University. Also in the lower right of photo is Post Vice Commander David Smith. 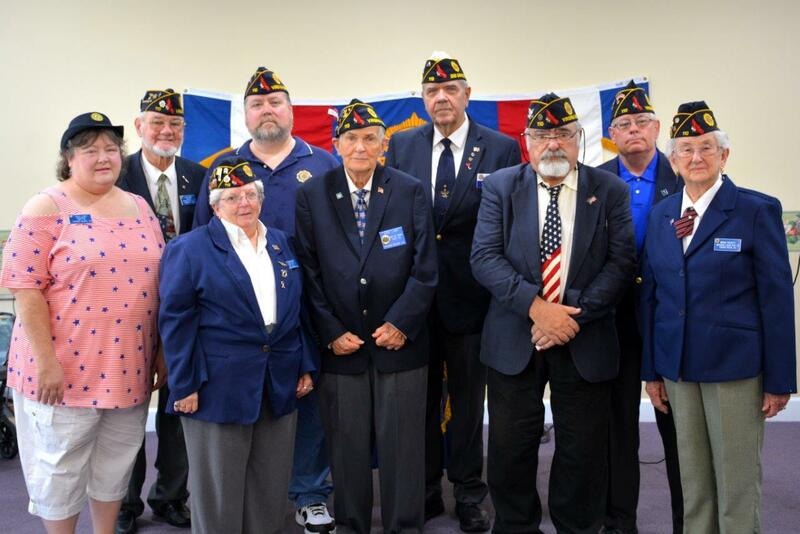 American Legion Post 110 and Post Auxiliary Officers for 2016-17 were installed by Ted Van Horn, Past Commander Post 327 and 2nd District, on July 13, 2016 during the monthly meeting. In the photo are (left to right) front row: Ted Van Horn, Sandy Wendell, Dale Smith, Ann Sokolowski, Tonya Jones (Auxiliary Commander), back row: Steven Wild, Mary Kinkin, Fred Kinkin, Steve Sokolowski, David Smith, Dan Ryan (Post Commander). Absent from the photo are Robert Melberg and Doug Uhlmann. Photography by Bert Wendell, Jr.
American Legion Posts 110, 113, and 118 participated in the Flag Day Ceremony at the Our Lady of Perpetual Help Senior Care Center (OLPH), 4560 Princess Anne Road, Virginia Beach, VA on June 14, 2016. 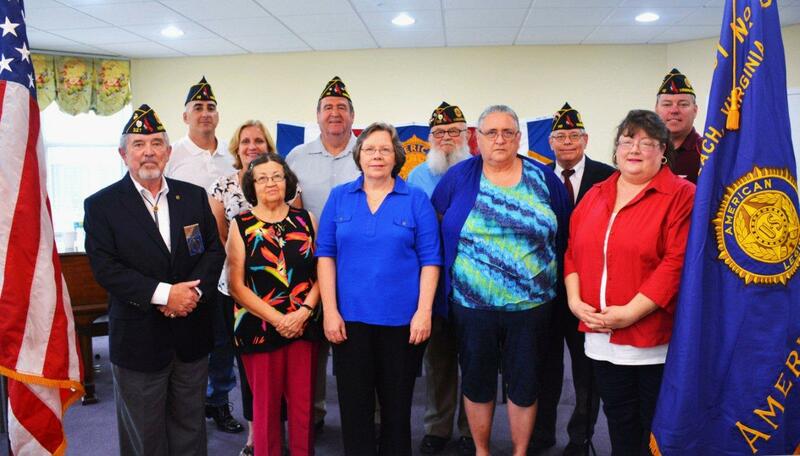 In the photo (left to right) are Gerald "Jake" Land, Post 113; Miriam Triscritti, Post 110; Post 113 Commander Wayne J. Mead; Post 118 Commander Susan Merling; Clifford J. Dietz, Post 113; Arlene Kevitz, Post 113; and Bert Wendell, Jr., Post 110 Past Commander. 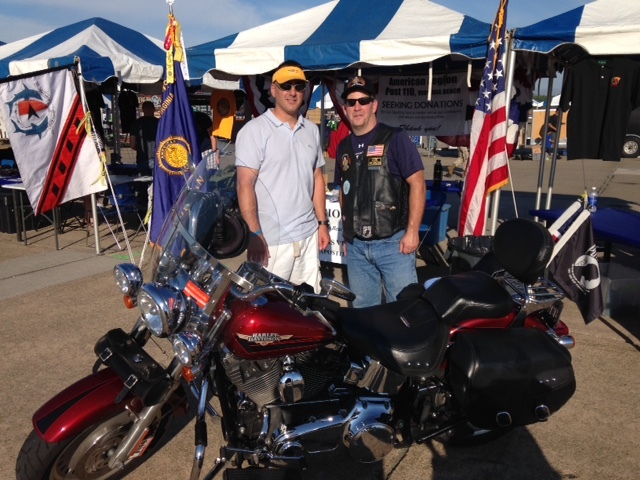 American Legion Rider Chris Chiaro of Post 327 helped Post 110 Legionnaire Steve Wild recruit new members and spread the word on how the American Legion helps veterans and the local community. 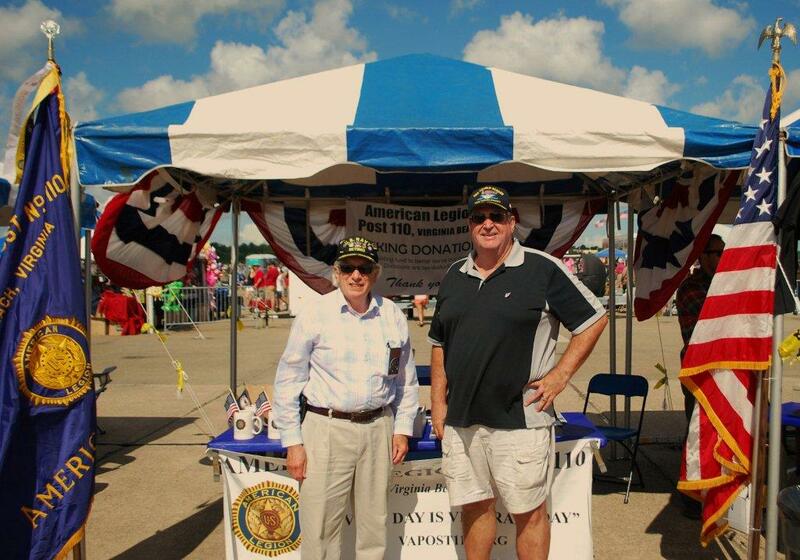 Legionairres Bert Wendell, Jr. (left) and Fred Kinkin (right) manned the American Legion Post 110's Membership Booth at the 2015 NAS Oceana Air Show in Virginia Beach, VA on Saturday September 19, 2015. Donations were also accepted to help fund the purchase of a building suitable to be the Post's Permanent Home. 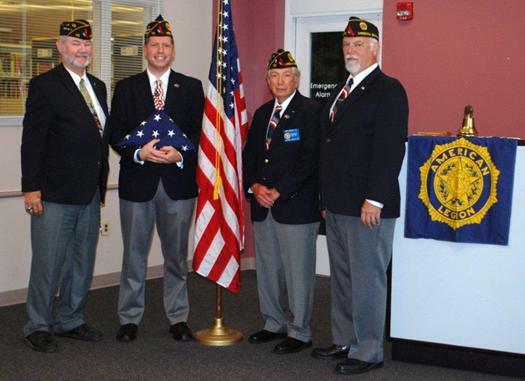 American Legion Post 110 held its monthly meeting on August 12, 2015, 7:30PM, at Our Lady of Perpetual Help Senior Care Center, 4560 Princess Anne Road, VA Beach, VA 23462. Guest speaker was VA Delegate, 21st Legislative District, Ron Villanueva. 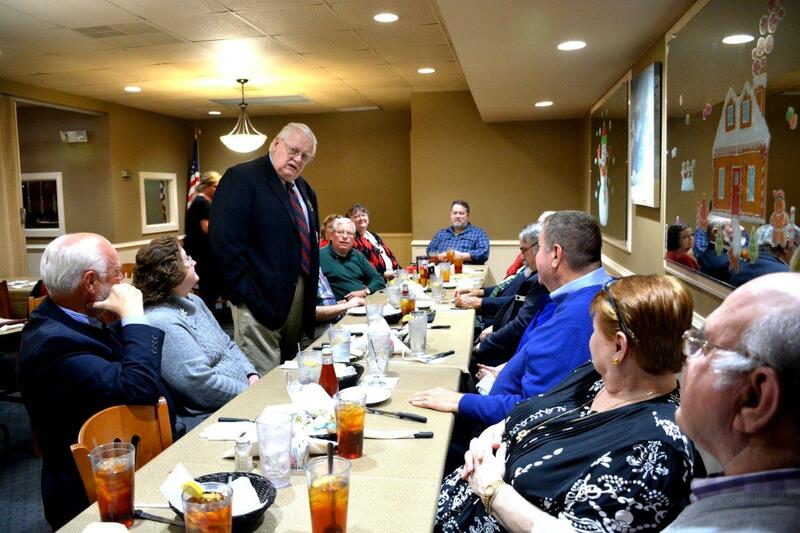 He spoke on topics of interest to the attending Legionairres, such as, the building of a new VA Medical Center in VA Beach, the transportation improvement plans for the area, clean power plan and much more. In the photo (left to right) are Post Commander Dan Ryan, Vice Commander David Smith, 2nd District Commander Ted Van Horn, Delegate Villanueva, MCPO Mike Jones, USN and Joe Vaccaro, American Legion, VA Department Judge Advocate General. 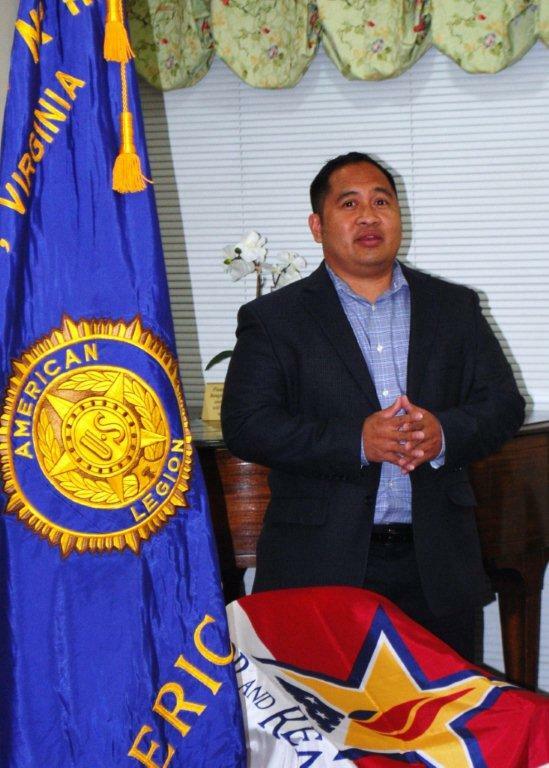 On August 12, 2015, Virginia Delegate Ron Villanueva, 21st Legislative District of the City of Virginia Beach, spoke to the Legionairres of American Legion Post 110 on various topics, such as, the new VA Medical Center being planned for the VA Beach area, improvements to the transportation system, clean electrical power plan, and other items of concern to the public and the military veterans. 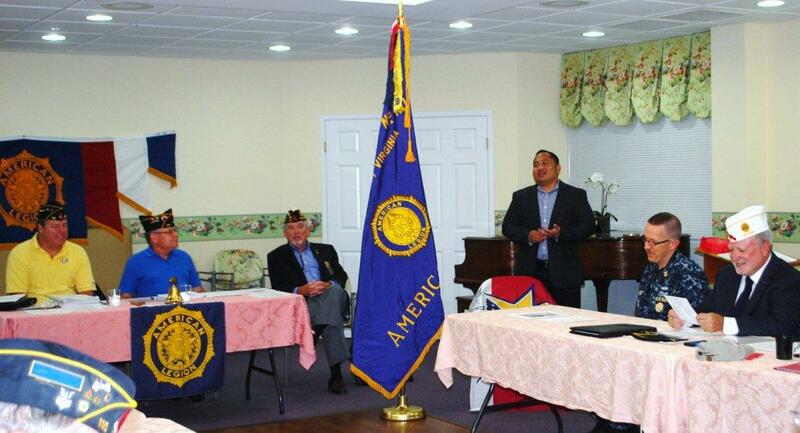 Delegate Ron Villanueva (center), 21st Legislative District, City of VA Beach, was the quest speaker at the August 12, 2015 meeting of American Legion Post 110 at Our Lady of Perpetual Help Senior Care Center, 4560 Princess Anne Road, VA Beach, VA. Others in the photo are: (left to right) Chaplin Beorge Schmidt, Historian Steven Wild, 2nd Vice Commander Bob Melberg, Commander Dan Ryan, Delegate Villanueva, Vice Commander David Smith, 2nd District Commander Ted Van Horn, and Legionairre Craig Huber. 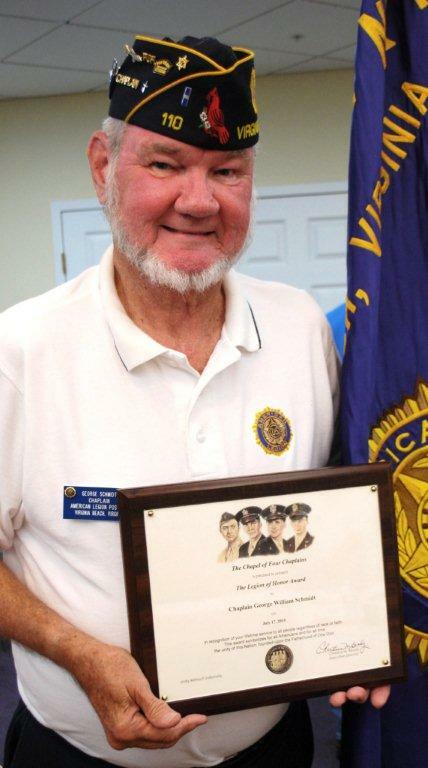 American Legion Post 110's Chaplain George Schmidt holds "The Chapel of Four Chaplains' Legion of Honor Award" that was presented to him on July 18, 2015 at the Virginia Department Conference held in Roanoke, VA.
American Legion Post 110 of Virginia Beach, VA had its Installation Ceremony of new Post officers for 2015-2016 on June 10, 2015. Past Commander Bert Wendell, Jr. passes the gavel of office to new Post Commander Dan Ryan. Others in photo are (left to right) 2nd Vice Commander Robert Melberg, Vice Commander David Smith, Dan Ryan, Bert Wendell, Jr., Finance Officer Steve Sokolowski, Chaplain george Schmidt, Adjutant/Service Officer Doug Uhlmann, and Historian/Sergeant at Arms Steven Wild. 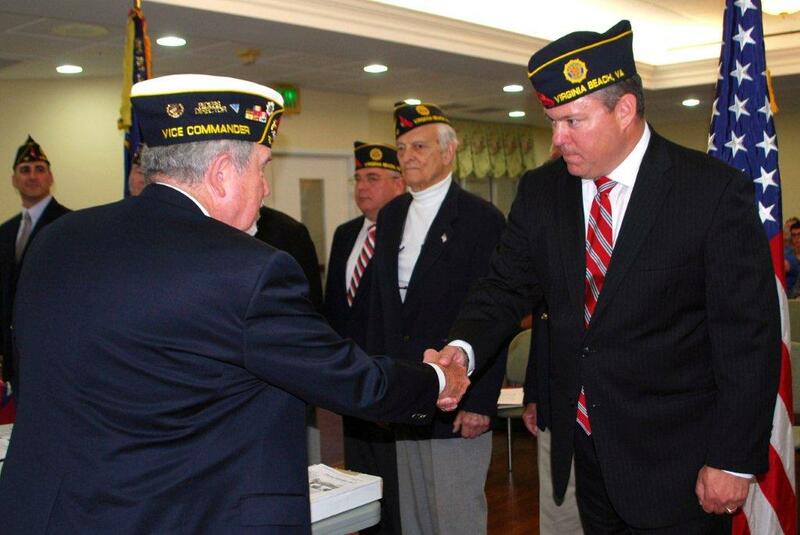 American Legion, Virginia Department, 2nd District Commander Ted Van Horn (left) congratulates Dan Ryan (right) for becoming the new Commander of American Legion Post 110 of Virginia Beach, VA on June 10, 2015. 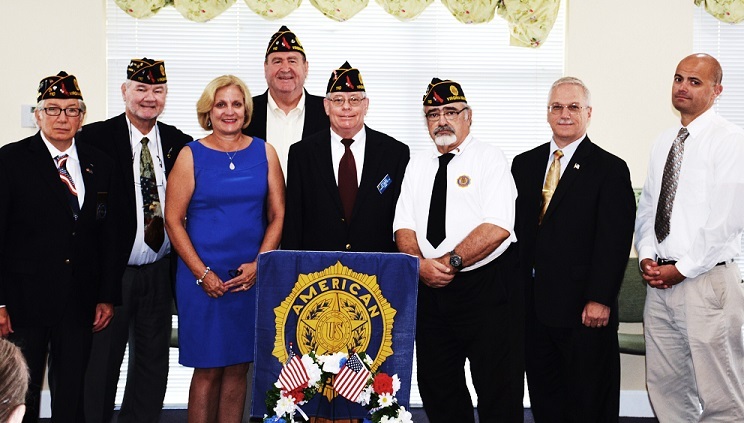 American Legion Post 110's 2015-2016 officers were installed by Virginia Department 2nd District Commander Ted Van Horn (left) on June 10, 2015 during the Post's montly meeting. In the photo (right to left) are Post Commander Dan Ryan, Vice Commander David Smith, 2nd Vice Commander Robert Melberg, Adjutant/Service Officer Doug Uhlmann, Finance Officer Steve Sokolowski, Chaplain George Schmidt, and Historian/Sergeant at Arms Steven Wild. 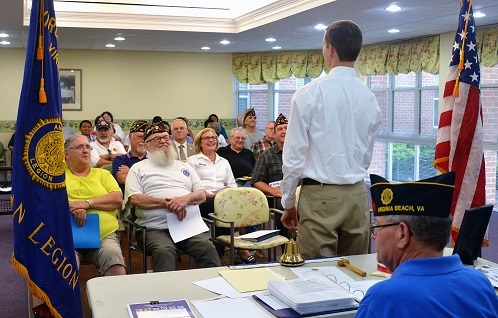 American Legion Post 110 of Virginia Beach, VA welcomed their 2015 Virginia Boys State Delegates on June 10, 2015 during its monthly meeting. In the photo are (left to right) Vice Commander Dan Ryan, Commander Bert Wendell, Jr., Austin Stansberry and Jose Ramos from Bishop Sullivan Catholic High School, Ryan Miller, Luke Dryer, and Samuel Dyer from Kellam High School, Post Boys State Coordinator Wendell Parker and Virginia Department 2nd District Commander Ted Van Horn. 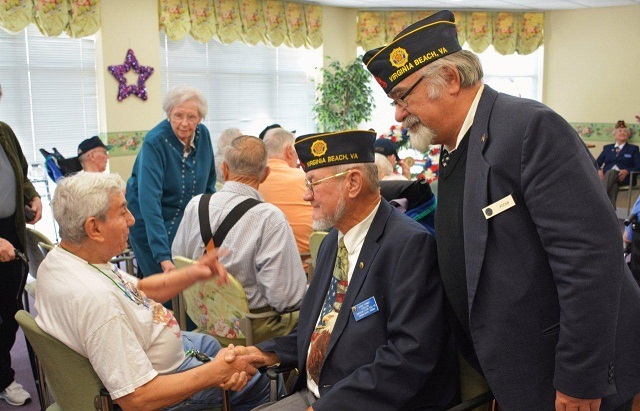 American Legion Post 110 of Virginia Beach, VA held a Veteran's Day Ceremony at Our lady of Perpetual Help (OLPH) Senior Care Center at 11:00 AM on November 12, 2014. Honoring th veterans were (left to right back row) Steven Wild, George Schmidt, Dan Ryan, Post Commander Bert Wendell, Jr., Miriam Triscritti, and Craig Huber. In the front row are four military veterans residing at OLPH. 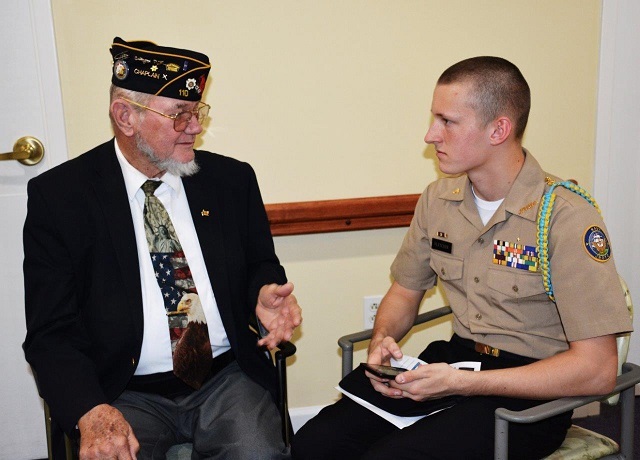 Veterans Recognition Night "Share Your Story" was held at Stratford University in Virginia Beach, VA on November 7, 2014 at 7:00 PM. American Legion Post 110 was invited to participate in the ceremony by Ricky Allen (center), Stratford's Military Outreach Coordinator. Post 110 legionnaires attending were Post Chaplain George Schmidt (left), and Post Commander Bert Wendell, Jr. (right). 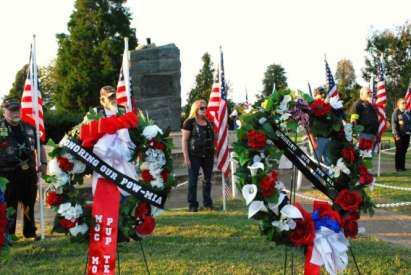 National POW/MIA Recognition Day Ceremony was held on September 18, 2014 at 6:30 PM. The ceremony was held at the Flame of Hope Memorial on Oceana Boulevard, Virginia Beach, VA near NAS Oceana. 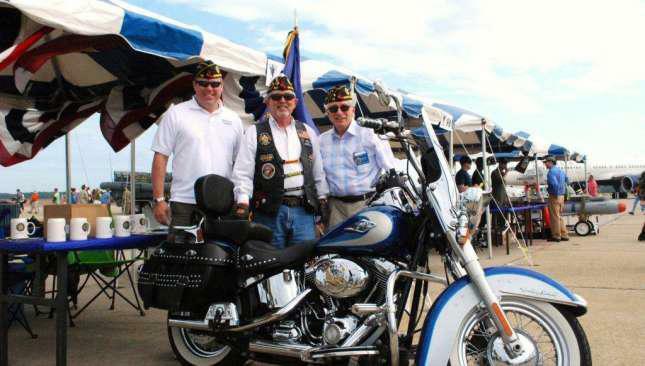 Attending was Post Chaplain George Schmidt, ServiceOfficer Doug Uhlmann, and Post Commander Bert Wendell, Jr.
American Legion Post 110 held a Membership Booth at the NAS Oceana Air Show on September 20-21, 2014. Working the event was Post Commander Bert Wendell, Jr., Vice Commander Dan Ryan, 2nd Vice Commander Robert Melberg, Legionnaire Craig Huber, and 2nd District Vice Commander Ted Van Horn(American Legion Riders) and his motorcycle. 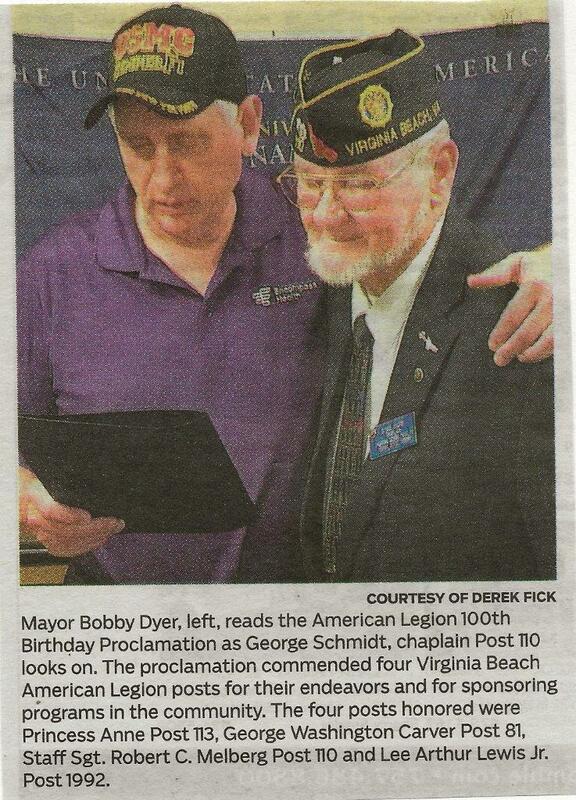 11 September 2014, 10:00AM, Patriot Day Ceremony at OLPH, 4560 Princess Anne, Virginia Beach, VA. Pictured in the photo (left to right) are: Dan Ryan, Post 110, Vice Commander; George Schmidt, Post Chaplain; James Ramsey, District Chief, VA Beach Fire Department; Tim Riley, Battalion Chief, VA Beach Fire Department; Bert Wendell, Jr., Commander, American Legion Post 110; Miriam Triscritti, Post Legionairre; Pat Gallagher, Captain, Commander 4th Precinct, VA Beach Police Department; Norman Holcomb, Captain, VA Beach Sheriff's Office; and Doug Uhlmann, Post Adjutant and Service Officer. 01 July 2014, 4:00-6:00 PM, 50th Anniversary of the Vietnam War Ceremony held on at the Virginia Beach Convention Center. The event was sponsored by the Office of Congressman Scott Rigell. Attending were Commander Bert Wendell, Jr., 2nd Vice Commander Robert Melberg, Chaplain George Schmidt, and Historian Brian Abbott. 24 June 2014, 2-4:00PM, U.S. Flag Etiquette Class, Tuesday, at Bayside Library, 936 Independence Blvd, Virginia Beach, VA. Attending were Commander Bert Wendell, Jr., Chaplain George Schmidt, Historian Brian Abbott, and Legionnaire Craig Huber. 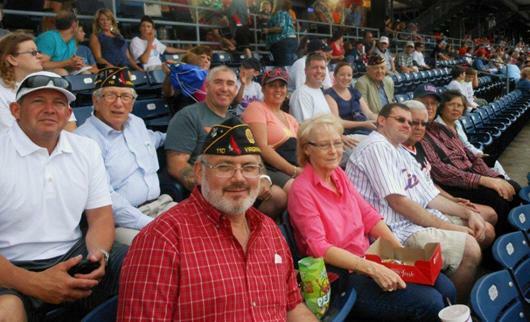 21 June 2014, 7:00 PM, American Legion Post 110 attended a Norfolk Tides Baseball Game at Norfolk’s Harbor Park. Post 110 members attending were Commander Bert Wendell, Jr., 2nd Vice Commander Robert Melberg, Historian Brian Abbott, Legionnaires Terry Howard, Mark McMillian, and Marshall Clark. There were also 9 family members and guest.